Lovely card Pat...perfect for the occasion. This is one of my favorites Pat! Beautiful layering and matting! 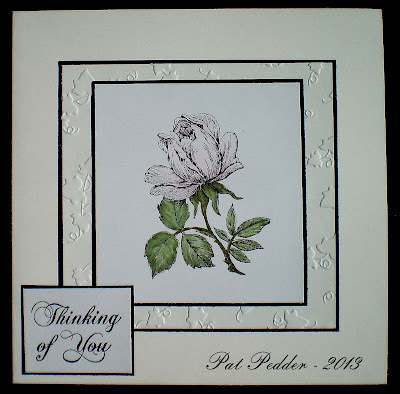 Thanks for sharing your project in the Sympathy Challenge at Aud Sentiments. clean,simple and elegant. What a perfect sympathy card. Love the soft colors - just perfect! This is beautiful Pat. That rose stamp is fabulous - and the embossing folder used for the next layer teams with it perfectly. Hi Pat, thanks for your lovely comment on my blog…. your card is really beautiful… I love the image and the gorgeous embossing… it's perfect for a Sympathy Card! Beautiful hun, love the embossed layer & the image! Love this elegant, clean and simple card. Perfect for the occasion.